Once you have exported and saved a P2C file from your ROS utility, this can be imported into BrightPay in order to update each employee record with their latest PAYE and USC credits and cut-off point details for the current tax year. 1) At the prompt, browse to the location where the P2C file has been saved to. 2) Select the P2C file and click Open. The word ‘Update’ displayed next to an employee name indicates that the employee is already set up within your payroll and there are changes to their current tax credit certificate information. By default, all employees will be ticked for import of their PAYE & USC details. 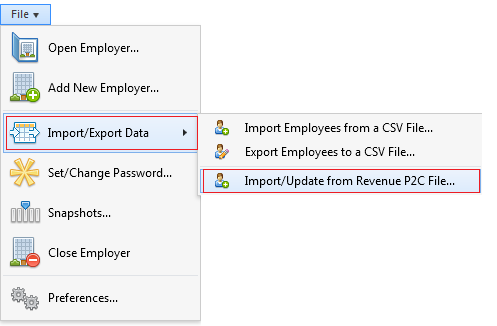 For any employee whose details you do not wish to import via the P2C file, simply untick the box next to their name. The phrase 'No Changes' next to an employee's name indicates that the employee is already set up within your payroll, but there are no changes to the tax credit certificate information already entered within the software. If there are employees in the P2C file who are not in BrightPay, these will be indicated by the word ‘Add’ displayed next to their name. Should you wish to add these employees to your payroll using the P2C file, simply leave the box ticked next to their name. For any employee whose details you do not wish to import via the P2C file, simply untick this box. In addition, click Options at the top right of the screen to select the pay frequency you wish to add these employees to. Please note: due to basic employee information contained within a P2C, it is recommended that any employee record set up in this manner is then reviewed following the P2C import. This will allow the user to enter additional employee information not contained in the P2C file e.g. marital status, contact information, payment method etc. 5) When ready to perform the import, click "Import" at the bottom of the screen. A success message will appear to confirm how many employees were updated/ added using the information in the P2C file.